The organization of the YMCA of Pangasinan was a result of program of the YMCA of the Philippines in 1926, to nationalize the YMCA movement which called for the initiation of more vigorous YMCA expansion work outside Manila, particularly over Luzon and cities of Visayas. And rightly so because a few years after the first YMCA building was erected in Lingayen town, a big flood devastated the province and swept away the building and other valuable properties. And after the building was rebuilt, Japan invaded the Philippines a few years later and the Pangasinan YMCA building did not escape the shelling and bombing from both the invaders and the defenders of freedom. Then again in 1990, a killer earthquake literally reduced its building in Dagupan City into rubbles. This year’s rain in July and then again in August flooded and affected the shelters and livelihood of almost 500 hundred families in the city alone. 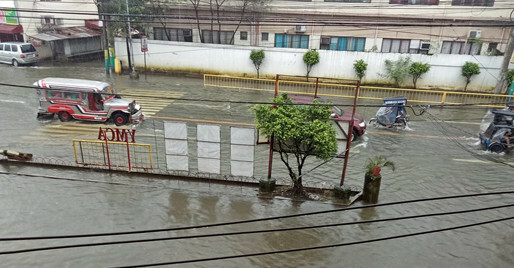 Dagupan City where YMCA of Pangasinan is situated was hit by floods two times -- in July and August. Other towns also affected are Calasaio, Mangaldan, Sta. Barbara and Binmaley. About 1,000 families and estimated 2,000 individuals were affected emotionally, physically and spiritually. Some families are still not able to go back home because of the continuing rain and if it is high tide, waters will again flow up to 1 foot high. 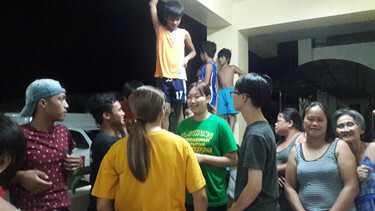 They stayed in the evacuation center provided by the government. Service is part of YMCA’s objectives. This is a very rare opportunity for our members to render or extend our hands to all in need of our service. And as the needs arise we need to strive harder to give the right services needed by the people and to strengthen our capacity to reach out and create more space for the community, especially to the young people. We need to enliven their spirits and their morale as victims of calamities. At the beginning this was made possible because of the increasing concerns of our members, especially our Board of Trustees and staff, and our local and international partners. The YMCA of Pangasinan strengthened its collaboration, as a member of the Federation of YMCAs in the Philippines, and also thru the Global Alternative Tourism Network (GATN), for immediate responses and actions towards disasters and natural calamities. If the Pangasinan YMCA continued to be one of the most active organizations in the province today, it is because its leaders and members have relentlessly worked hard for it since it was founded 92 years ago. Pangasinan YMCA defied all the odds and, except perhaps during the war, it never slowed down in extending its services to those in need. It has become sturdier and stronger after surviving the test of time. It continues to renew its commitment to fulfill its enduring purpose of developing in an individual a well-balanced Christian life and Christian mission, as well as to promote unity among peoples of all faiths. 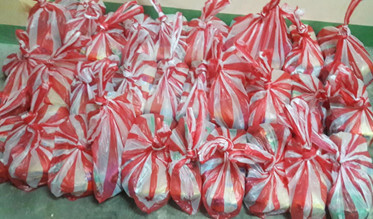 YMCA of Singapore and Nanyang Technological University students - their donations and gifts of love to our partner communities. 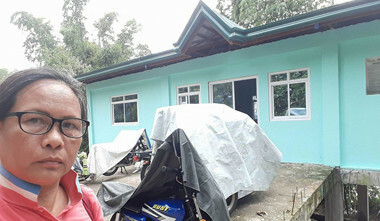 The community centers which were built during their camp – the Community Learning Center and Multi-Purpose Hall – were all used as temporary shelters for the affected families. 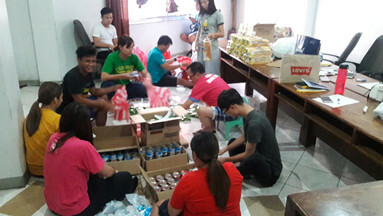 And also the volunteers and interns form the YMCA of Saitama (Japan), YMCA of Taichung (Taiwan), YMCA of Anyang (Korea), Raonatti volunteers of Korea YMCA. For now, YMCA of Pangasinan may only be providing temporary dwellings for transients through its hostel facilities. There are still many things to be done for all those affected by the typhoon, all of which needed a lot of funding. With the collective efforts of our generous Y`ers and partners, Pangasinan YMCA will overcome all adversities - as it has done for decades now. Good Action Towards Natural Calamities - our immediate response. The opening ceremony was graced by the president of the Islamic Organization of Timor Leste, Hadji Ali Al-Ayyubi, who gave the keynote address. 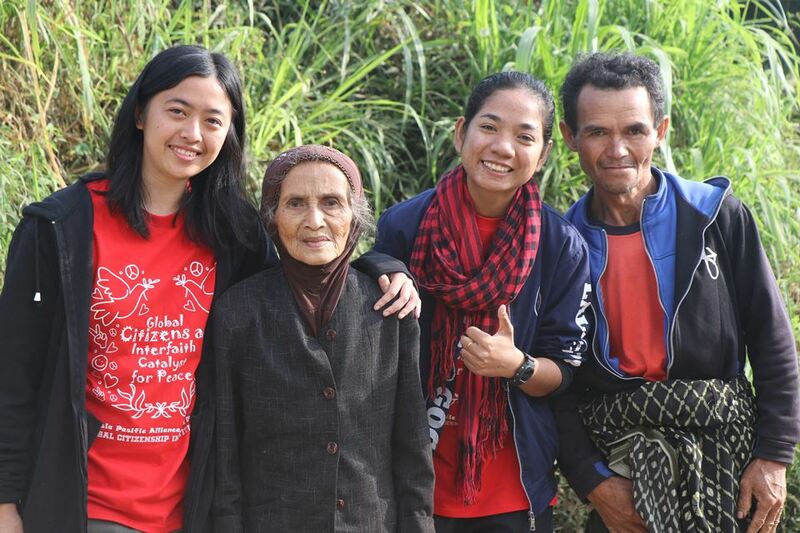 He challenged the youth to choose the path of serving the Timor Leste people. The president of the national forum, Leonardo Gamboa Marçal welcomed the participants and the facilitators, and explained the rationale for the workshop. This was followed by National General Secretary of YMCA, Antonio da Silva who gave a brief orientation on the history and structure of YMCA. This was supplemented by Muriel Orevillo-Montenegro later on the third day, to show the context of the spread of YMCA in Asia and the recognition of the religious plurality in Asia. 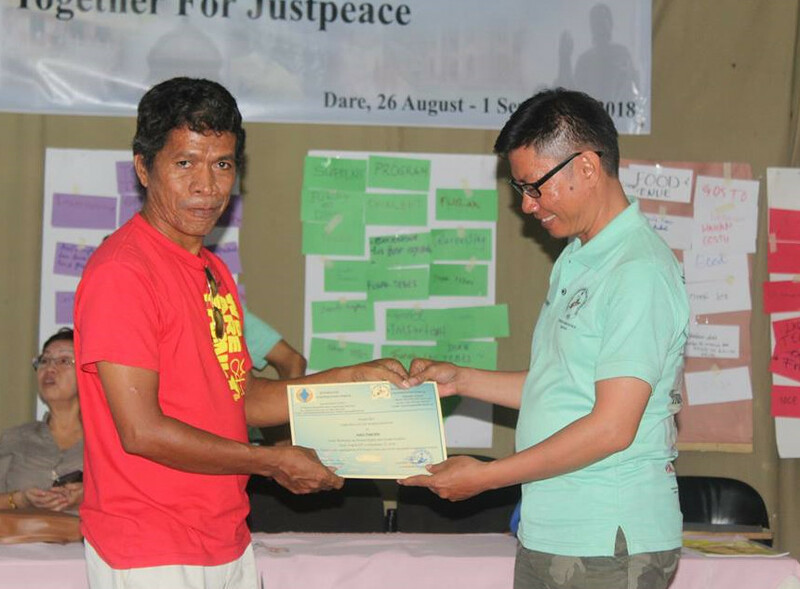 This understanding led APAY to create a program on Interreligious Cooperation Forum (ICF). Manuel Monteiru, who was active in the human rights movement in Timor Leste and heading a human rights organization spoke at the workshop. Marilia da Silva Alves spoke on children’s rights from her experience as head of an organization that attend to the welfare and rights of women and children called Fokupers. Prof. Bernardo Leto, a university professor spoke on the religious pluralism and the importance of interreligious harmony. 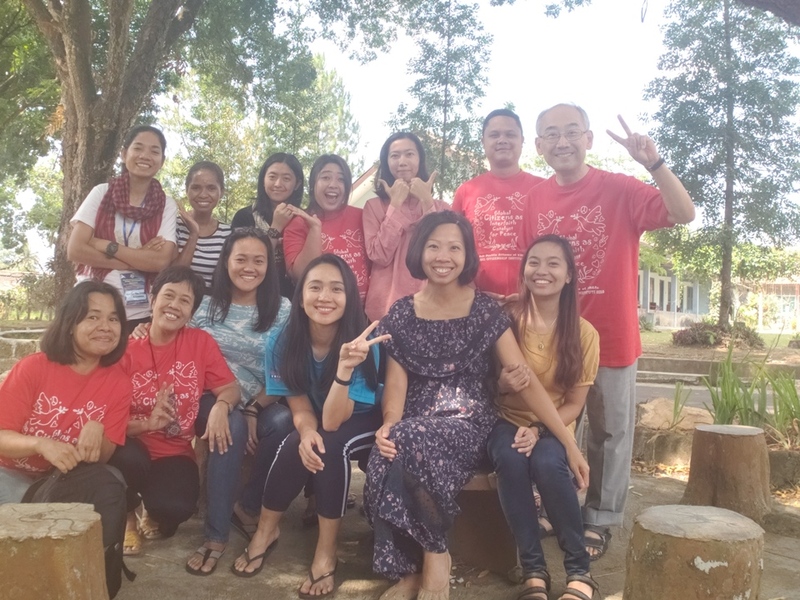 Ms. Nina Nayoan, an Indonesian who once served as staff of the World Student Christian Fellowship (WSCF), a holder of a master’s degree in biblical studies, and will be teaching feminist theology in Manado. She facilitated the workshop on gender equality and the conflicts that arise from gender inequality and injustice. 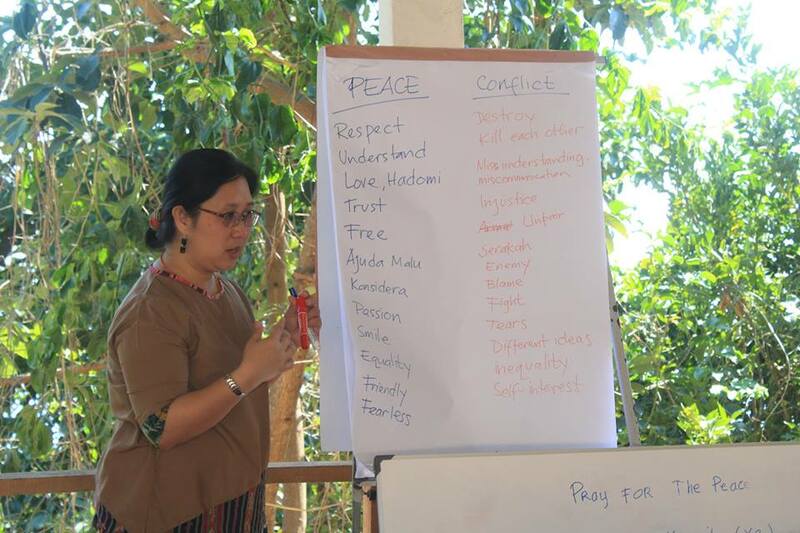 The participants were also challenged to reflect on peace in relation to gender justice. Her lecture was interspersed with workshops in analyzing the realities of gender relationships in society. She praised Timor Leste for signing the UN Declaration of Human Rights, the Convention on Children’s Rights (CRC) and the Convention on the Elimination of All Forms of Discrimination against Women (CEDAW). The ICF Coordinator, Muriel Orevillo-Montenegro facilitated the workshop on planning a program for peace. She started with a brief review on the understanding of peace – in positive and negative sense, of violence – indirect and direct, and on how people view conflict differently. This was followed by different approaches in planning such as the log frame and effect chain. However, she pointed out that planning for a peace project will be benefited more from the approach called Reflecting on Peace Practice (RPP). Five groups were formed to work on the task of identifying a problem or a conflict, identifying the forces for and against peace, as well as the key actors in the identified conflict. The group proceeded with conflict mapping, and identifying the areas that could be the entry point for intervention. 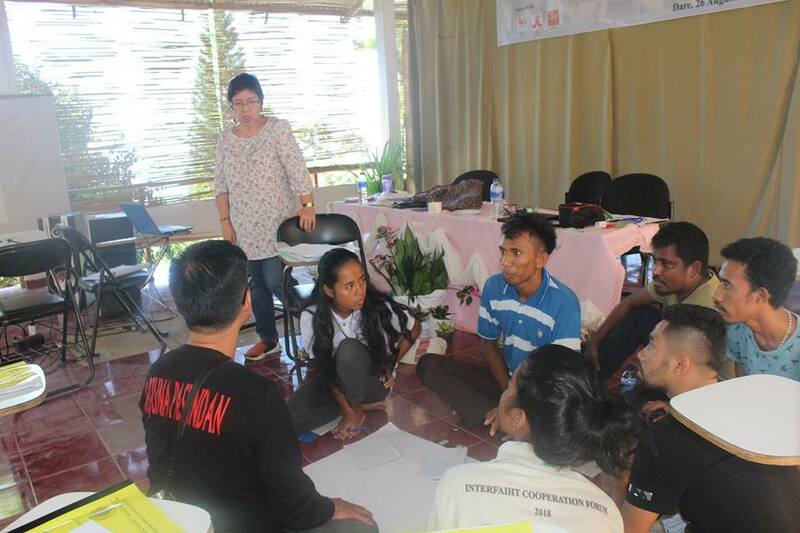 Then, the participants were to make a plan and proposal based on their respective outputs that was to be presented the day after the community visit. The community visit happened to be on a holiday, the day Timor Leste celebrate its “Referendum Day” when the people decided to be a country separate from Indonesia. The participants visited an orphanage for children with disabilities run by the ALMA nuns. Then the group proceeded to observe the games in Maneuana, where Horacio, a board member of YMCA has organized the youth. The community visit was capped by a hike up to the statue of Cristo Rei. 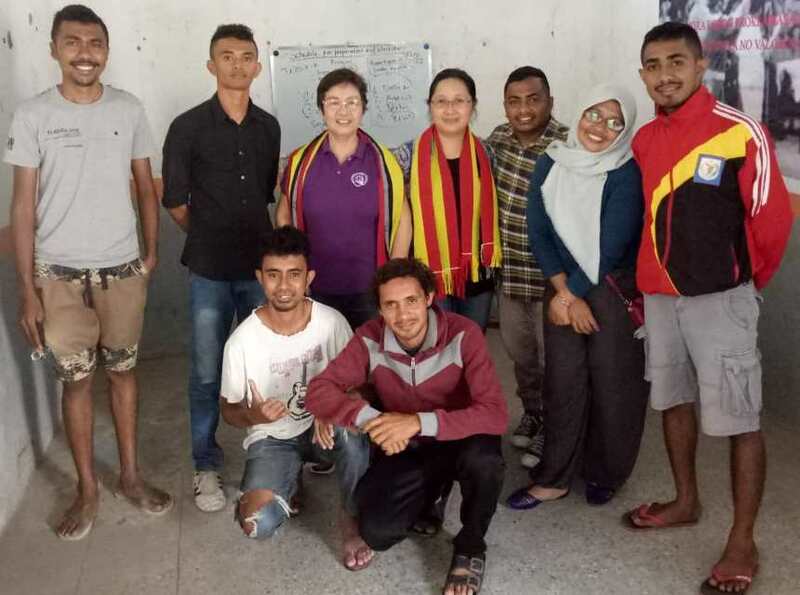 Overall, the participants were enthusiastic, led by a core of ICF-Timor Leste leaders who have demonstrated their passion and commitment to the efforts for equipping the youth with knowledge and skills to serve their country. The morning meditations were led by the participants. Umi Farida was asked to lead one morning meditation through yoga and sharing of experience. The participants learned new peace songs, which they sang in-between sessions. One evening was spent for a solidarity night, and the rest of the evenings were spent watching documentary films, such as “The Occupation of Timor Leste by Indonesia,” “What is Human Rights?” and “Girls Rising.” During the workshop in planning, the documentary film “Chicken a la Carte” was used as a jumping board for conflict analysis. The workshop ended with the giving of certificates of participant and appreciation. One of the main goals of Interfaith Cooperation Forum is to promote an interfaith justpeace movement in the Asia region by providing an opportunity for young people from different faith backgrounds, nationalities and especially those who come from the conflict area to come together to explore different diversities, and sometimes step out of their comfort zones in order to relearn and welcome new ideas. In collaboration with Guangzhou YMCA, through our School of Peace alumni from 2015 Ms. Yolanda, the ICF organized a week-long mini SOP from August 12th to 20th for 12 Chinese youth including two volunteer staff from Cambodia YMCA during their summer camp with the theme “Relationship with Peace” This was held at Meta Karuna, a Jesuit Retreat Center, at Siem Reap, Cambodia. The group spent 5 days in community exposure with Cambodia YMCA in Phnom Penh visiting the historical place S21 where they learned a very painful experience of Cambodian people in the past during Khmer rouge, visiting the slum to get a picture of what is poverty, and then went for home stay in Kampongthom Province where they helped with construction for the poor in the rural area. Following this they came to Siem Reap to visiting Angkor Wat and spend a week time joining our program. The Mini SOP started by them sharing their experiences for the first time in Cambodia. The group come up with many questions in their mind relating to the life of Cambodian people such as: What is the role of government and NGO to provide good education to the poor? What is the affect from the history into present time for Cambodia? What is the government’s responsibility to combat poverty? What is the crying need for Cambodia? With their curiosity and critical thought, Max Ediger the ICF former Coordinator now helped serve as resource person during this Mini SOP. He started the sharing with the session on “Pedagogy of Education-Paulo Freire” by looking at the goal of education as the problem-solving approach rather than defining the right or wrong answer. Education must reflect and involve marginalized issues specially to help find a way to focus on experiences of the students, and use many critical questions for them to educate themselves and find their own solutions. “Education is not to prepare for future life, education is a life itself” (Dewey). The following day Mr. Hem Sopharak, Program Officer of Interfaith Cooperation Forum also shared a session on “Identity and Conflict” looking at culture and how it influences our way of life and thought. Understanding what is our multiple identities and how do they contribute to conflict in the society through identifying our own stereotypes and prejudices. Learn to feel uncomfortable, a willingness to take the first step to cross barriers, make mistakes, to ask important questions and a willingness to be changed. “In order to Learn first we must Unlearn so that we can Relearn”. Sister Denise and Mr. Reth the founder of Jesuit and Refugee service in Cambodia also spent time sharing with us about the issues of refugees in South East Asia and the current situation of refugees around the world. 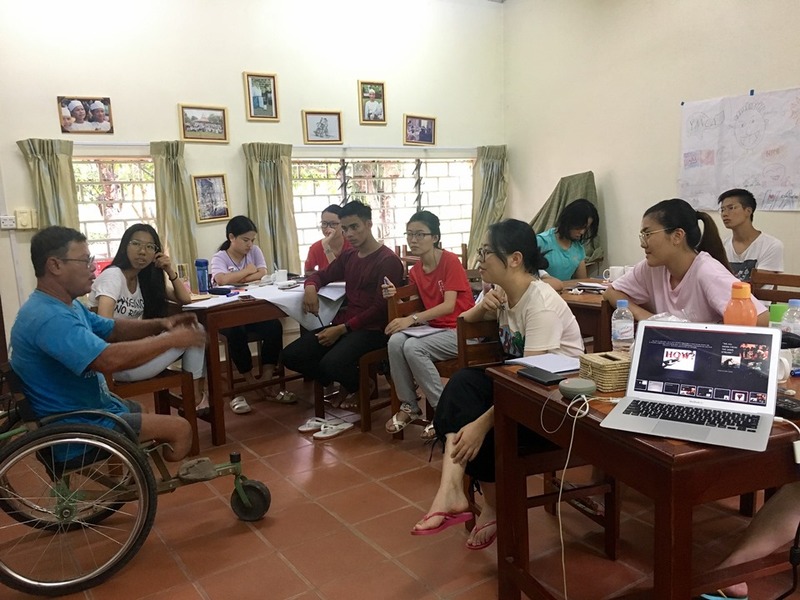 They also shared the story of the struggle of Cambodian people combating land mines and cluster bombs in Cambodia almost 40 years after the civil war ended. The group also spend time reflecting “What are the results of War?” then we visited the war museum in Siem Reap hearing more information, how cold war after world war II has influenced a small country like Cambodia to take part until we had our own internal conflict during Khmer Rouge and who was behind the suffering of the people, who supported the brutal violence in order to keep the killing going on almost 3 years. For the present situation of Cambodia, our friends also had a chance to meet with Mr. Seng Phalla alumni from 2017 SOP also a member of Cambodia National Forum, who works very closely with Women empowerment group and Labor movement, sharing about the economic structure and development in Cambodia for the past 10 years, how does it help improve the life of marginalized people but at the same time how does it create problems to them economically and sociality. Social Economy is considered as an alternative economic system today, when the market economy has completely failed to bring economic emancipation for the marginal people in both developing and developed world. The outcome from the Bretton Wood institutions, established in the last century after the WW2, never brought any good news for the mass people of the countries of the global south. The market economy dwelt on the values of profitability only, which made the world divided between the rich and the poor and the gap ever widening. In such a situation, there was a need for an alternative way to nurture the economy, based on the values of cooperation, mutual respect, social entrepreneurship and social welfare. The social economy, is termed as ‘third sector’ and ‘non-profit sector’, this usually refers to the various organizations between the state and the market, fulfilling both economic and social welfare objectives. It is a wonderful co-incident that the YMCA movement and the first cooperative movement were established same year 1844 in England, one in London and the other in Rochdale. Both the movements were formed as an alternative response to the counter the drawbacks of the Industrial Revolution. The YMCA being a social organization, can also be termed as a social enterprise. 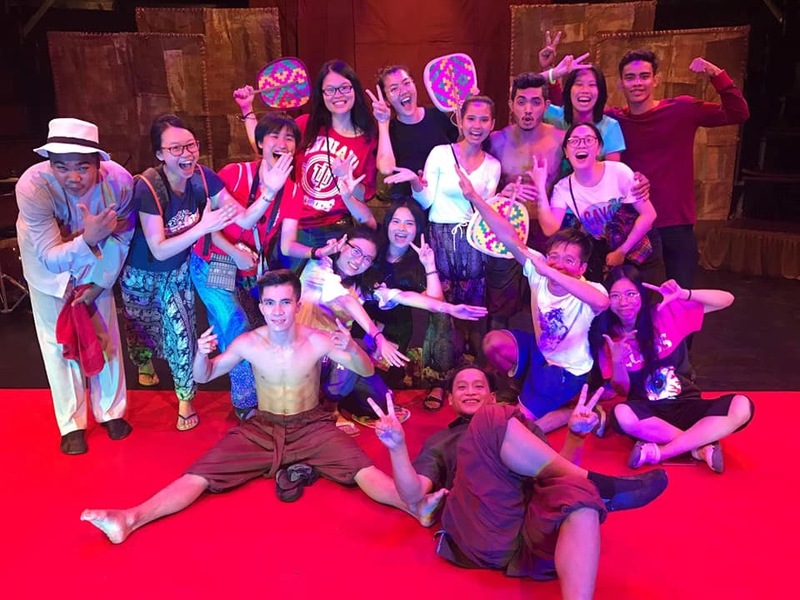 This is because, the YMCAs especially in Asia and some other parts of the world have been resorting more on social enterprises for their sustainability as well as fulfilling their social responsibilities. In addition, these social enterprises also channeled resources for the YMCA’s social oriented programs for the communities. The YMCAs are popularly known for hospitality industry and healthy living programs, have developed a host of hotels, resorts, campsites, swimming pools, gyms and other health programs. Similarly, the YMCAs also run a good number of educational institutions likes, schools and colleges. A large number of YMCAs in the developing world are involved in micro-finance activities through forming self-help groups. All these social ventures are involved in service for the society but also bring surplus finances for the YMCAs for reinvestment for the common good of the communities. As such the YMCAs can undoubtedly be categorized as social enterprises. The YMCAs are working towards youth empowerment, and creating employment for them is one of the focus areas of YMCA work. 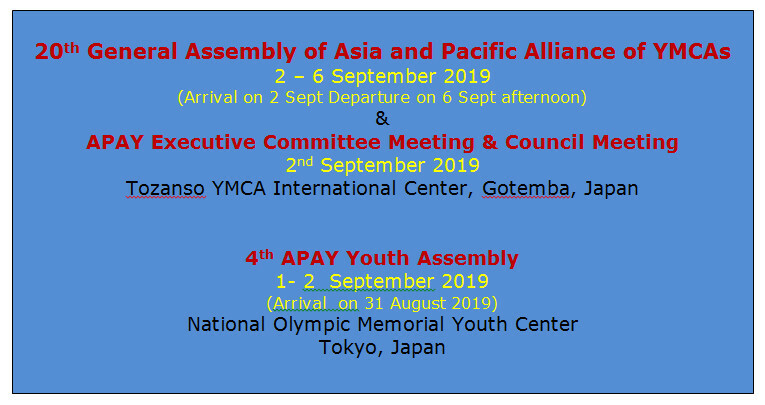 The Asia and Pacific YMCA accepted ‘social and solidarity economy’ as one of the main thrust areas for the following quadrennial plans at the 18th General Assembly in 2011 and at the 19th General Assembly in 2015. 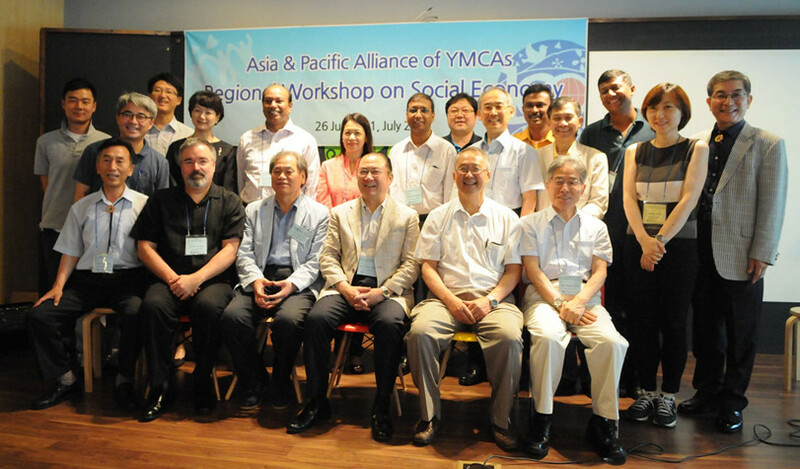 Hence, the first APAY Regional Workshop on Social Economy was held in Seoul, Korea from 27th to 30th June 2013. At this conference the YMCAs were encouraged to initiate small and medium scale social enterprises to promote organic farming, alternative tourism, fair trade, handicraft productions, online-stores etc, underscoring the need of creating job employment for the youths through these initiatives. A vast number of YMCAs are now involved in social entrepreneurship programs. The Bridges Project of Victoria YMCA of Australia is a half way home empowering youths for job creation after the completion of their terms in the prisons. Another example is the Project PRISM, where the YMCAs aim to train thousands of kids to know the art of swimming, in order to avoid the danger of drowning, a common threat for kids in Australia. The Chinese YMCA of Hong Kong trains youths to run café and bakery and also trains them to run balloon-art enterprises, who supply balloon decorations to social and corporate events. The Chiang Mai YMCA of Thailand runs social enterprises in handicraft production, where the majority of the products are exported to foreign markets. The Batticaloa YMCA of Sri Lanka is supporting thousands of borrowers for self-employment through their micro-finance operations. The Korean YMCAs are involved with cooperatives and had been instrumental to promote them throughout the country. 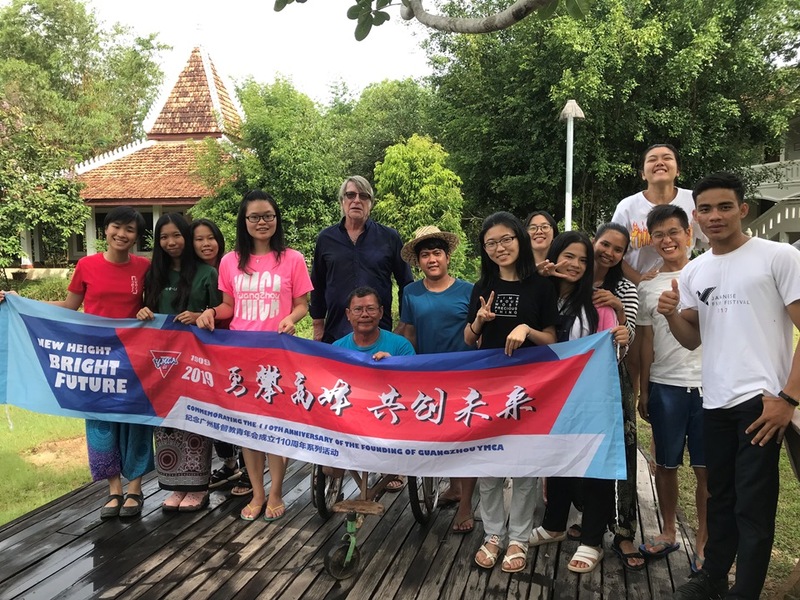 This is how the YMCAs, especially in the Asia and Pacific are increasingly engaging themselves in social enterprises with an objective to support people for their economic emancipation. As described in the beginning of this essay, social economy could be considered as the ‘third sector’ for economic emancipation of the people on the onslaught of the capitalistic hegemony. This could be the solution, however there are a host of hindrances which poses as an impediment for the growth of social enterprises. There is a sort of ignorance about the concept and understanding of social economy enterprises. The youths do not know that social enterprises can be a pivotal vehicle to create employment for them. The governments as well as the civil societies movements need to work towards promoting social economy enterprises. Investments are not so easily available for the social enterprises. Young people inspired in the spirit of social entrepreneurship, finds no easy way to get investments for their social ventures. Usually, they come from impoverished families who do not have much capital of their own, nor can they get loans from the banks, primarily, because in most of the countries there is no legal framework for social enterprises. The governments of Hong Kong, Singapore, Korea are pioneers in enacting laws for regulation of social enterprises, moreover, to promote such social endeavors, they have set aside government funds for investing in social enterprises. Countries need to work in formulating legislations for social enterprises and liberal tax regulations for them. In the absence of any legislation, the social enterprises cannot enjoy tax benefits, which are commonly expected for the growth of social enterprises in a country. There is lack of role-models in this area. There are not adequate business models on social enterprises, which could inspire youth to get involved in these ventures. Adequate trainings for social entrepreneurs are pre-requisite for a healthy growth of social enterprises. Social movements can initiate programs to train youths and getting them engaged in social enterprises, and providing information about financial resources and technical knowhow. It is understood that Social Economy is the answer to bring down disparity in the world and economic emancipation of the marginal communities. All it requires, is the concerted efforts of our civil society organizations to effectively advocate for the promotion of social economy and involve the people to participate. There are a lot of good stories in the Global North that these initiatives have changed the fate of common people, and this too will happen in our Global South in the days to come, if we can effectively promote social economy and bring end to the vagaries of neo-liberalism. At the 7th Annual General Meeting of the National Council of YMCAs of Japan held at Tozanso, Mr. Mitsuo Oikawa was appointed as the new president of National Council of YMCAs of Japan. Mr. Oikawa was brought up in YMCA family, and his experience at the Boys Camp at Tokyo YMCA Camp Nojiri as a member and a counselor has developed his core value and characters during his adolescent years. Working as a business person, he spent 6 years in New York and served as a volunteer for the Tokyo-Frost Valley YMCA partnership which provides Japanese children and families in New York area with Out-door and Cultural programs at Frost Valley YMCA in New York State, USA. 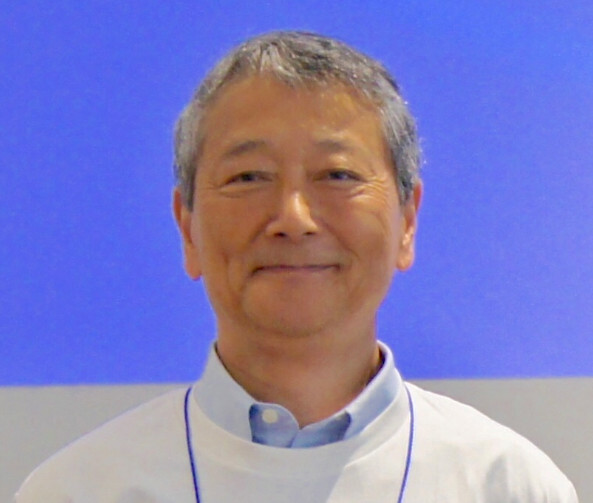 In 1998, Mr. Oikawa started to serve Tokyo YMCA as a member of Board of Councilors and since 2004 he served the National Council of YMCAs of Japan as a member of Board of Councilors and Directors. We hope and pray that the Japan YMCAs will strongly move forward with the leadership of Mr. Mitsuo Oikawa towards our new-branding vision "Positive Net". Matt Roberts has been elected as the President of the National Council of YMCAs of New Zealand on 26 May 2018. He is a performance-oriented management professional with a proven track record in leadership, business transformation, enhancing service levels, managing business and information systems risk, improving workflow processes and managing profitable relationships. 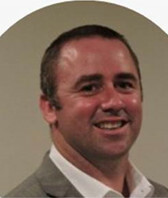 Currently he is the Vice President of YMCA Auckland and Immediate Past Chair of Diabetes Auckland. He is the former President of Titirangi Tennis and Squash Club and Auckland Waterski Club. We wish and pray that the YMCA of New Zealand will progress further under his dynamic leadership.